A swirl of cheesecake turns a plain brownie mix into something special. 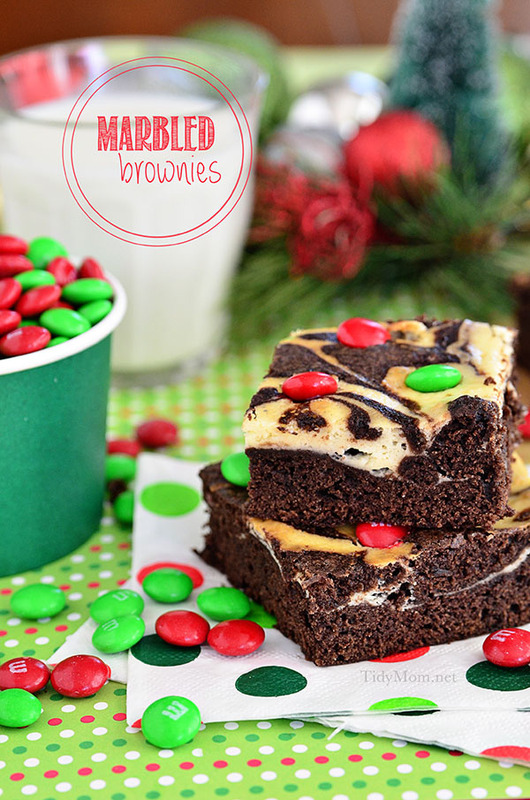 Marbled Brownies are holiday ready with M&Ms® Brand Chocolate Candies on top. 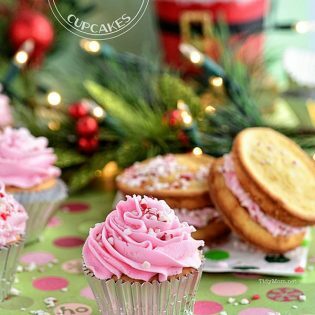 Rumor has it, the unofficial baking season is here! Confirmed by looking at my kitchen. By mid-November I like to start baking up goodies that we can pass out to friends, neighbors, the groomer, my husband’s customers, take to parties……you name it. If you see me, I won’t be empty-handed. Every year I like to try a new recipe or two, but I have to have a few old favorites that have stood the test of time. 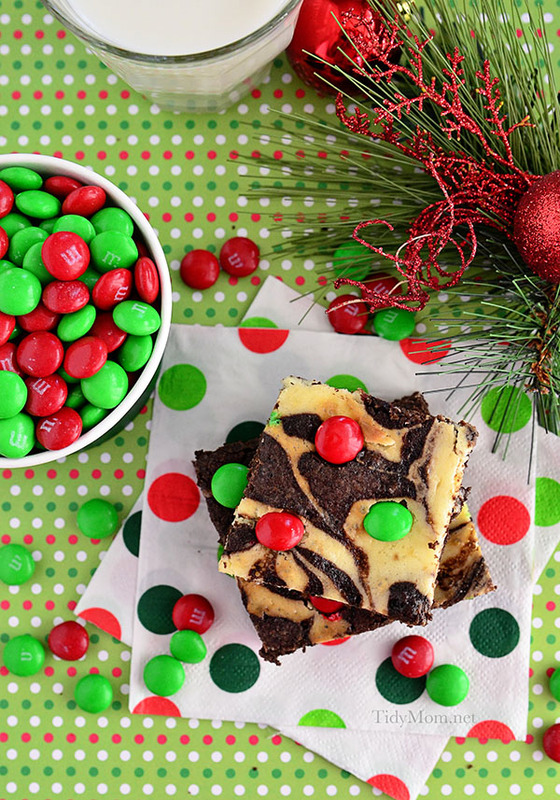 Brownies are always a given, but the other day I made a batch with M&Ms® Brand Chocolate Candies and cheesecake that brought them to a whole new level of fabulous. They would be perfect for any dessert table or holiday cookie tray. 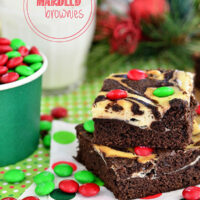 I found this recipe for Marbled Brownies on BrightIdeas.com, which is full of fun recipes to bake this holiday season. What’s great about these brownies, is you can change them up to fit any season, holiday or celebration by the color of M&M’S® Brand Chocolate Candies you put on top. 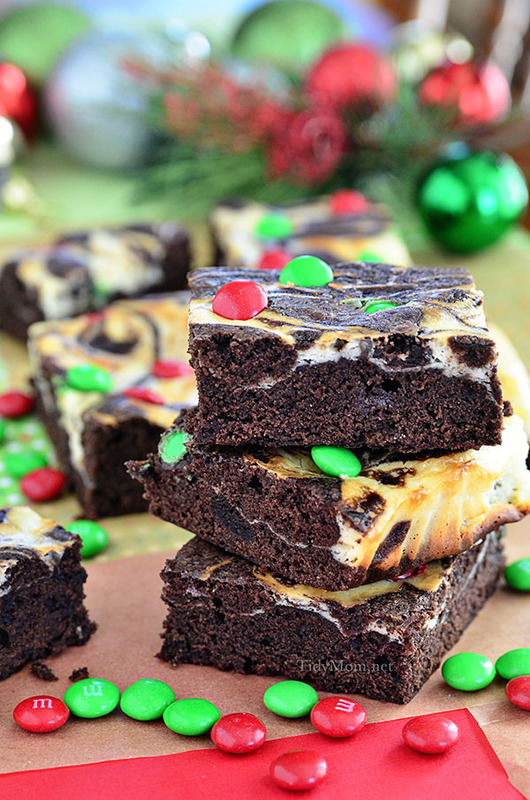 Holiday’s are better with Marbled Cheesecake Brownies. A swirl of cheesecake turns plain brownie mix into something special. What's great about these brownies, is you can change them up to fit any season, holiday or celebration by the color of M&M'S candies you put on top. In a mixing bowl, beat the cream cheese with the sugar. Add the egg, milk and vanilla extract. Set aside. Prepare the brownie mix according to the package directions. Spoon 2/3 of the brownie batter into a parchment-lined 9 x 13-inch baking pan. Spoon the reserved cream cheese mixture over the brownie batter. Now scrape the remaining brownie batter over the cream cheese mixture. Swirl the tip of a knife through the batter to make a marbled effect. Press M&M’S® Brand Chocolate Candies into the batter. Bake for 45-50 minutes in a preheated, 350-degree oven until slightly moist in the center. Cool completely before cutting 8×4 into 1½-inch squares. Disclaimer: This is a sponsored conversation written by me on behalf of MARS®. As always, the opinions, views and love of M&Ms® are all mine. So fun a festive! I need to get my Christmas baking going! These look amazing! Perfect for the holidays! And probably after. Love the brownies and love your festive photos! So cute! 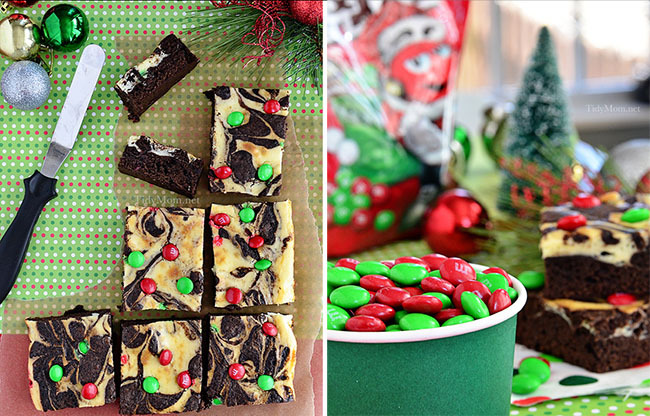 I love the pops of red and green with the marbled Brownie! Loving these brownies, Cheryl! Perfect for sharing this holiday season! These look scrumptious and I love your decorations. Festive and fun! These are SO good! Gorgeous photos!! Love the marbled look and the pop of the Xmas M&Ms! I love the M&Ms on top….so festive and pretty!!! Hi… I was wondering if I could use this recipe and photos in a school project. It would be great if I could. Thanks! I made these this morning to take to my church Christmas bazar, but was disappointed when all of the M&M’s completely sunk into the cream cheese topping! The only available holiday M&M’s at the store were the Holiday Mint M&M’s. Maybe the Holiday Mint M&M’s are too large and heavy, or the cream cheese should be the regular kind and not the softer low fat variety. Thanks so much Cheryl, this is great! !